Jenny and her husband were concerned about whether it was safe to have their baby in bed with them. Jenny knew it would be easier to breastfeed at night with baby close at hand, but she had also heard of babies who died in bed while co-sleeping with their parents. After a good deal of thought, Jenny decided to put the baby’s bed in the master bedroom, but still wasn’t sure about bringing the baby into her bed. The first few days at home were a blur. It seemed like the baby nursed constantly and every time they put the baby on his back in his bed, he woke up within a few minutes. Jenny’s husband tried walking and rocking the baby so Jenny could get some sleep, but he wasn’t very successful. Everybody was stressed. Feeling frustrated and exhausted, Jenny laid down on her bed as she nursed her baby. She watched as he came off the breast and settled peacefully beside her. “We’ll stay here for just a couple of minutes,” she thought sleepily. Jenny woke with a start an hour later. The baby was still sleeping peacefully, lying beside her. Jenny immediately felt guilty that she had brought the baby into her bed; all of the warnings she had read flashing through her mind. Were Jenny’s actions dangerous to her baby? Let’s take a look at the current recommendations, research, and realities of co-sleeping to tease out the answer. There are lots of recommendations about sleeping arrangements, but not much agreement. In addition, concerns include several issues. SIDS is the most common concern, but entrapment, strangulation and suffocation are distinct but relevant sleep issues. In their 2011 statement, the American Academy of Pediatrics recommends room-sharing (baby on a separate surface close to parents), but not bed-sharing (baby sleeping on bed with parents).With this stance the AAP acknowledges there is strong benefit to sleeping in close proximity to babies for the sake of breastfeeding, while coming down on co-sleeping due to safety concerns. The AAP’s stated concern is that sleeping on the same sleep surface can “be hazardous under certain conditions.” They go on to enumerate several “hazardous conditions” such as head covering, entrapment (as between mattress and wall or headboard), overheating, exposure to cigarette smoke and such. The Academy gives great weight to the value of breastfeeding in terms of long term health. Studies have shown that breastfeeding mothers and babies sleeping in close proximity have synchronicity in their sleep cycles, mothers respond more quickly and more frequently to baby’s cues, and baby breastfeeds more during the night. Human infants are relatively immature and require frequent feeds for optimal growth. Frequent night-time feeds help establish and maintain a plentiful milk supply. Thus the Academy of Breastfeeding Medicine recommends parents be counseled on ways to make their sleeping solutions safe rather than cautioned against the practice. 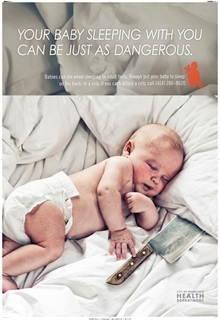 Some other public health agencies have taken recommendations to an extreme level, equating sleeping with your baby with something as dangerous as a baby sleeping with a butcher knife, or showing a baby in an adult bed with the headboard designed as a tombstone. Clearly, there is no agreement in terms of recommendations! Suffocation, strangulation and SIDS, bed-sharing vs. room sharing, breastfeeding vs. formula feeding, on a bed vs on a couch…sleeping with your baby has many confounding variables. This makes research difficult and comparing and evaluating research even more difficult. For instance, if one research study doesn’t make the distinction between sleeping in a bed versus sleeping on a couch, the results of that study can’t be compared with other studies which have taken those differences into account. When examined in detail, more infant deaths are associated with couches and recliners than with beds. They can’t be lumped together and say all sleeping together is bad. Another example: Statistics taken from unconfirmed death certificates make no assessment of the influence of alcohol or drugs or even type of feeding…simply that there was a death associated with a shared sleep surface. In other words, most bedsharing deaths are associated with preventable risk factors. However, with so many conflicting studies, it’s hard to tease out a course of action. My favorite resource to cut through all the confusion is Sweet Sleep by Diane Wiessinger, Diana West, Linda Smith and Teresa Pitman. (Find it at La Leche League International or Amazon.) It is a comprehensive discussion of many variables with an abundance of references to research, along with a very practical guide to make sleep as safe as possible. It takes the well-known risk factors, step by step and makes practical suggestions on how to build a safe sleep environment. For instance, in talking about a safe surface, one step is to look for places a baby could get entangled or stuck. Two beds side by side sometimes leave a bit of a gap between the mattresses. Solution? Sweet Sleep also talks about many practicalities that will come with time, like whether it is safe for baby to sleep with mom when mom is sick, or what to do about pets who like to sleep on the bed. Considering the realities of co-sleeping outlined below, this can be an excellent resource. 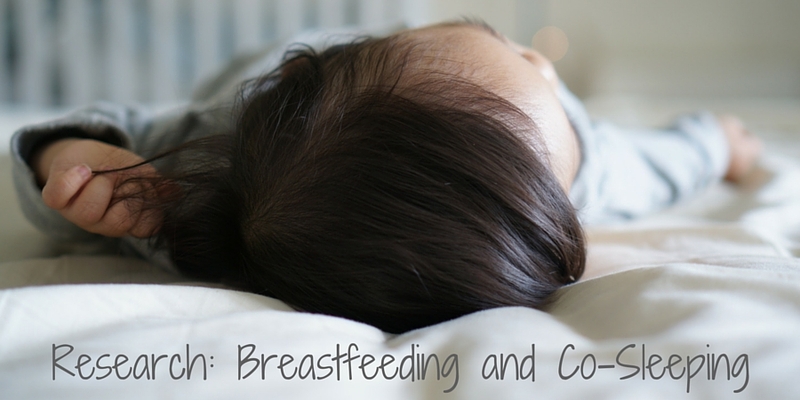 While the research and recommendations from breastfeeding authorities are often at odds, it’s all academic compared to the reality of co-sleeping in the United States. Reports in the US indicate about half of babies sleep with their mom at some point. A United Kingdom newspaper recently reported that in a study of 600 women, 46% admitted to lying to health care workers about sleeping arrangements with their baby. Whether it is intentional and well-thought out, or comes from the frustration of a crying baby who will only settle when sleeping with mom, it’s pretty likely that a majority of babies sleep with mom at some point. Even if you don’t expect to sleep with your baby, why not plan a safe sleeping space together just in case you have one of those nights where sleeping together seems like the only way to get through the night? This will take away the guilt factor, reassuring you that you have done the very best you can for your baby. Mom needs to be a non-smoker. Everyone in the bed needs to be alcohol and drug free. Mom needs to be breastfeeding. Baby should be healthy and full term. Make sure baby lays on his back. Don’t overheat baby; keep swaddling and extra blankets off. Make the surface safe: no super-soft mattresses, waterbeds, strings, cords, toys or extra pillows and watch for cracks or gaps that could trap baby. There is no one right answer for every family or even every baby. Prepare. And then relax and enjoy your baby. Ask a Bra Fit Expert: Why is my bra band riding up?